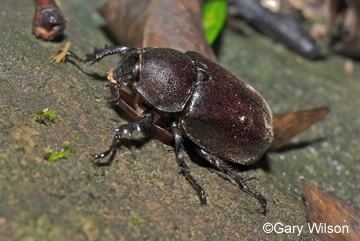 These large, up to 6 cm long, black to dark brown beetles, which are chiefly nocturnal, are most commonly observed in the summer months, particularly around lights. 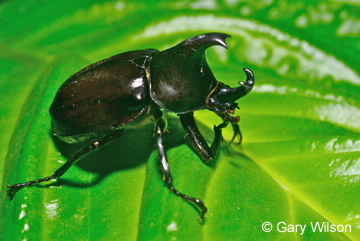 The male is a shiny black with forked horns on head and thorax. The female is a matt black and lacks the horns. Adults make a hissing noise when disturbed. And feed on the soft bark of trees. Mature larvae to 5 cm long are greyish with a dark brown head and are curled into a semi-circle. Usually found in compost or decaying plant material.